Because I am a workshop facilitator and responsible for disseminating job search advice, I must be cognizant of how I deliver my workshops, not simply the content. One of my favorite connections on LinkedIn and followers on Twitter, Pat Weber, has written a great article on how introverts can be effective public speakers because of their innate strengths. I have included it below in its entirety. This communication tip is written by Patricia Weber for the readers of Communication Weekly. Visit Weber’s website www.prostrategies.com. The recent post,How to overcome the fear of public speaking, had me thinking about how introverts could take advantage of who we are naturally and begin to see themselves in another light. 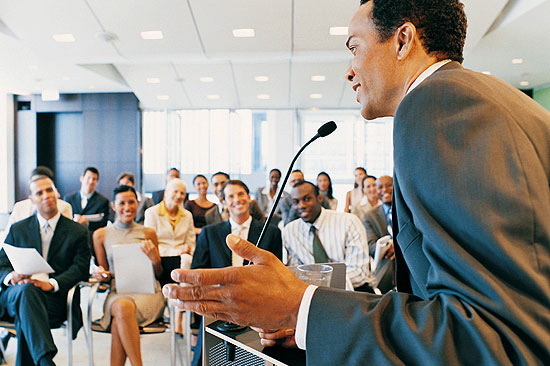 Public speaking for anyone in business is one of the best ways to attract clients in your community. Workshops and presentations are ways to deliver your message that reaches many people at one time. When you hone your message what you will find for example is, if you get into one Rotary, other Rotary groups will add you to their speaker of the week agenda. When I left my company “job” in 1990 I didn’t realize introverts were hindered to use one of the best marketing tools available – public speaking. Hone your message to where it delivers valuable content, and then, people become interested in tracking you down to talk with them about what you really do. It’s client attraction at it’s best. If you want to, you can eventually be a paid speaker. But let’s take public speaking for introverts and consider top three innate strengths we have for a solid foundation to make it work easily. Whether you are giving a company presentation, or delivering a sales presentation or even found yourself in the enviable position of being asked to speak in front of a professional organization. Certainly we have more strengths but let’s start right here. If you already believe introverts must be poor at public speaking because they lack the social skills, consider at least two things: first, as an introvert you already have many natural tendencies to be well-received on the platform and second, more demanding audiences today want to see evidence of this from the speakers they listen to. #1 – Analytical tendencies are needed to prepare and present. Know your audience, know your topic, be creative. Research of the audience and topic is naturally satisfying to introverts. Just as planning uses the front of the brain, introverts will find up front preparation adds to the success of a well-received presentation. When you are researching your topic, you’ll also be kick starting your creativity. Relax and savor your planning tendency. Audiences love prepared speakers just as they love the people who can speak eloquently extemporaneously. You can do this! #2 – Listeners want you to say something important. Audiences don’t want to hear small talk; they want to hear what is relevant for them. Yes; we might as introverts want to learn how to insert some humor, since it is something that bridges even the most serious, or dry topic, to where the listener wants to hear your message. Encourage participation to build the rapport between you and even just a few participants. And handling just those few potential difficult participants, well that is a must. But in the end, if you want a presentation score of 10 and a paycheck as a paid public speaker, our advantage of innately speaking only what is important, gets us 80% there. #3 Be the observer, not the participant. Introverts observe and listen before commenting. Speaking in public allows you the chance to observe, listen and then make a conscious decision of how to continue or which direction to go with a well-planned presentation. Just what are you observing for? How engaged is your audience? Are they taking notes, nodding their heads, asking questions? These are behaviors easy enough to – dare I say – do at the same time as you are speaking! With your intuition highly tuned, give yourself permission to observe the reaction of the audience to know if and when to make a presentation adjustment. These are just a few introvert natural strengths; many extroverts have to learn these very characteristics. This means we already have a solid foundation for public speaking. Do we have to learn some other pieces? Of course; but that’s no different than anyone else needing to learn what they don’t have. What do you think about bringing your strengths to the party of speaking in public? Are you willing? Because you are ready. Patricia Weber, www.prostrategies.com, leads and inspires the sales reluctant to discover their courage for that breakthrough for ultimate success. She is an internationally recognized expert on radio and in print as a Business Coach for Introverts. This entry was posted in Career Management, Career Search and tagged Business, Communication, Introvert, MBTI on January 3, 2013 by Things Career Related.